If you ever wonder why you’re seeing Administrator Mode Detected in Microsoft Chromium Edge? In this blog post, learn everything you need to know about it. 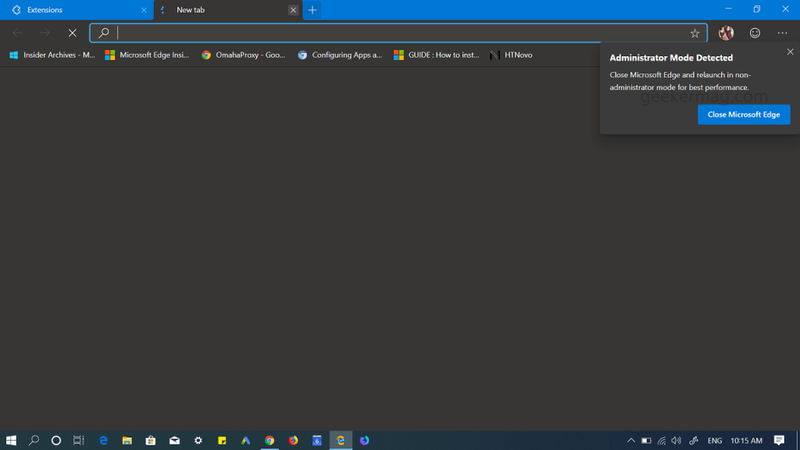 Some users reporting that whenever they launch Edge Chromium as an administrator or launch a link from software, which is initiated in administrative mode, a quick dialog box opens up in the upper right corner of the browser, telling users that you’re in the administrator mode. Whoever is seeing this message calls it annoying and thinks that it is an issue as Chromium Edge browser is under development, but the truth is that it is a security feature in the browser. Eric Lawrence confirmed the information on Twitter. Administrator Mode Detected is a security feature, and the warning suggests users to close the browser and run it without admin rights. It is because running the browser with administrator privileges can cause the browser to behave abnormally under various situations and it highly risky. It’s because whenever you run any program or software that open up from the Edge Chromium will take over its security level. For example, if you launch Edge Chromium with admin rights and launch it from the browser, then that particular program or process will also run with administrator rights. It is highly risky if you download and install a program that contains malicious code or malware. This will not only force the browser to behave abnormally but also gain full access to the browser accompanied by Windows. If you ever see a message that Microsoft Edge – Administrator Mode Detected, all you need to do is to close the browser and relaunch it from the desktop icon so that it won’t runs with administrator privileges. does not work just by closing the browser. running edge on windows 7 and i always get that message! I get the same issue as Fred Bisard. Closing and reopening doesn’t resolve the issue. I have noted however that on my work laptop, where I am not a local admin, I do not have this issue so maybe this will always happen if you are a local administrator?